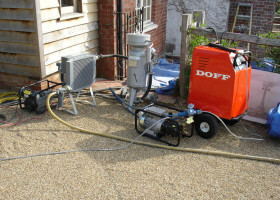 Heritage Blast Cleaning Ltd (HBC) based in Mayfield (East Sussex)?was launching a specialist sympathetic surface blast cleaning service across the South East of England. 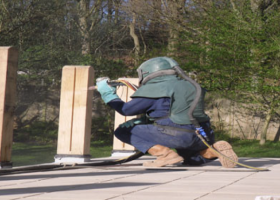 The HBC service employs the very new Jos-Torc and Doff environmentally friendly, chemicals free air and water restoration and renovation surface cleaning system for heritage and antique?stone, timber, oak, tile, granite, marble (etc). Launching the company required a cost effective strategy for this new SME. The aim was to establish HBC as the specialist company for this service. The HBC launch strategy essentially required a contact database to reach the HBC potential customerbase of construction companies involved in restoration and renovation projects, local council planning departments, restoration specialists, architects, civil engineers across the South East. I devised a brand identity and logo.I devised he HBC website as the centre of the marketing campaign. Then an HBC LinkedIn social media account populated with HBC cast studies, information fact sheets, press bulletins and newsletter. The aim of the launch strategy is 1) to connect building awareness; 2) influence brand confidence; 3)then generate sales leads – then maintain contact for future projects and retain brand awareness for the HBC service. The marketing route was to initiate contact.. the contact would be interested from the information within the LinkedIn account.. then visit the HBC website.. there they get brand confidence from the branding, website design, content, images, case studies – they are convinced regarding the HBC competency, knowledge, etc. In addition we held a successful half day Jos-Torc and Doff surface cleaning workshop, presentation?and demonstration inviting key potential customers such as?National Trust, English Heritage, local construction managers, local planning officers, architects. Within six weeksI had generated all the required HBC marketing collateral and a database of over 500 LinkedIn connections with key potential customer contacts. The company was launched and?within 6 weeks the HBC company and business was generating sales leads from across the SE of England?and from?London, Essex and neighbouring counties. Within 12 months the company had established the business, brand and service across the key catchment areas and beyond. Sales leads typically arrived via the HBC website contact form. In the second year we concentrated the marketing to direct sales – telemarketing to key customers to generate sales leads.